Yesterday Brian worked through lunch without stopping. He was hauling rocks from the river, and needed to get as much done as possible before the weekend. I brought him some food and took these photos of him working down by the river. Usually the Industrial department will dig their own stone out of the river, wash it and sort it into different sizes, and then crush some of it to make gravel. 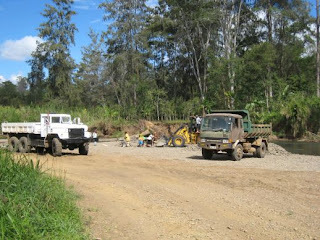 However, they needed a large amount of big stones for a construction project, and so they decided to buy it from the local villagers. There is often a lot of competition between different clans to get the rights to sell stone to SIL, since it is a good source of income. Brian was flooded with requests to buy stone from different haus lains, or clans. The locals put a lot of hard work into gathering stones. Women wade into the river, fill their string bags with four or five stones at a time, and then bring them to shore and form large piles. Brian wanted to gather as much as he could on Friday, because there was always a chance that we might get a big rain this weekend, and if the river floods then all of their hard work would be washed downstream! Yesterday Brian was supposed to get stone from four different spots along the river – which he originally thought belonged to four different clans. It turns out, however, that a wily older gentleman with four wives set each wife and her offspring to work on a different sandbar, and so all of the income was going to the same extended family. 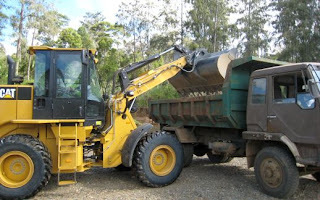 The front loader (yes, it’s the new one Brian just bought) would scoop as much as it could, and then the women would throw stones into the bucket by hand until it was full, when it would be dumped into a waiting truck. The work was done almost entirely by women. 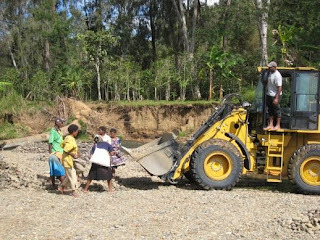 There were a few men standing around and supervising, and of course lots of naked children splashing in the river, but the women did the brunt of the work, which is pretty normal for PNG. Brian, do you pay more that a penny a rock? I bet Kyle likes this story :) Especially since he would be the one supervising with all his skills. We would need that and a rock crusher, those missionaries have it so easy. Still don't know how much those hard working ladies got paid?